Science Caturday: Kitteh Quake Time! It’s almost time for football season! What has that to do with either science or cats, you ask? Bear with us. We’ll get there. A few weeks ago, Kathryn Schulz published a widely-noticed article in The New Yorker about “The Really Big One,” that is, on the likelihood of a huge earthquake in the Pacific Northwest of the US. The piece pointed out the dense population and poor earthquake-readiness of the area around the Cascadia subduction zone, which includes the city of Seattle, Washington. However, at least some scientists in Seattle are preparing for earthquakes, and they’re using their local NFL fans to help them do it. The Seattle Seahawks’ fans are famously rowdy and noisy. After Marshawn Lynch’s “Beast Quake” touchdown in the 2011 NFL playoffs, the crowd’s roars not only shook the Seattle stadium, but also the surrounding ground. We know this because scientists at the University of Washington in Seattle had placed a sensor just across the street from the stadium. Seismologist John Vidale noticed a clear signal post-touchdown. Vidale realized that the energy of 70,000 fans jumping around for a minute could come close to the energy released by a small earthquake and that athletic events might be a good venue for testing seismic instruments. Football games have the added benefit of being scheduled in advance, unlike earthquakes. Vidale and his colleagues installed three portable sensors inside the Seahawks’ stadium just before the January 2015 NFL playoff games in Seattle. Somewhat surprisingly, the strongest signal didn’t show up during a game-changing play, but during the halftime show, as the crowd jumped and danced with the music. In addition to testing sensors, the researchers were able to develop software, called QuickShake, to display the seismic recordings on the scoreboard with a delay of just a few seconds. All of this work will help them better measure and analyze seismic activity, and potentially assist in improving building design and earthquake preparedness. You can learn more about the scientists’ work with the Seahawks here. So that’s the science. Where, you ask, are the cats? Told you we’d get there. 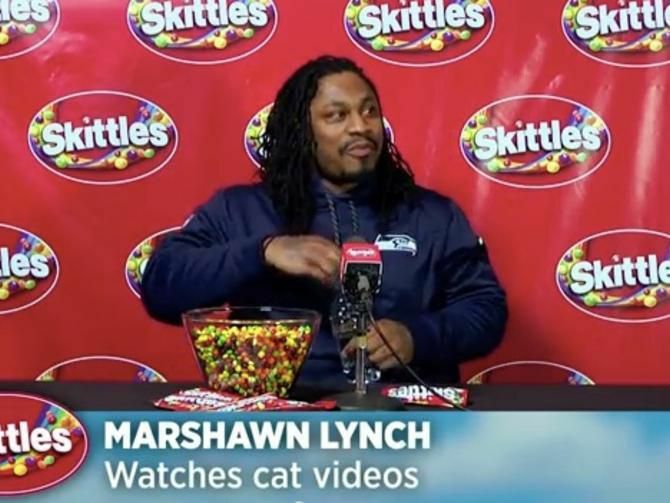 This entry was posted in Science Caturday and tagged earthquake cat, Marshawn Lynch, science cat, science lolcat, Seattle Seahawks. Bookmark the permalink.